This effort is part of a larger journey collecting Montana and Idaho county highpoints in August 2008. As I approached this peak after sundown I could not see the tracks beyond Edward Earl's carpark as described in this report. Hence I stopped there for the night. The only issues climbing-wise occur beyond 11,000 feet on the Class 3 rock bands interspersed by low quality ball bearing type scree. The steep rocky sections are readily negotiated with excellent foot and handholds throughout. More problematic, in my opinion, are the scree sections - particularly on descent. In fact, I found the overall experience returning from the summit to 11,000 feet to be thoroughly unenjoyable. The GPS-derived WGS84 summit coordinates are (44.14150° N, 113.08278° W) at 12,196 feet. The net elevation gain from my carpark is 4,800 feet and the total elevation gain is 5,100 feet due to a 150 foot drop into a ravine along the road grid as one hikes south. A high clearance two-wheel vehicle is sufficient for driving farther south; therefore this is not a 5,000+ foot gain county highpoint since the total gain under such a plan is 4,800 feet. I found a mineral near the 9,000 foot level on the eastern slope of hill 9,413T on descent. Glimmering yellow, and now at-home. 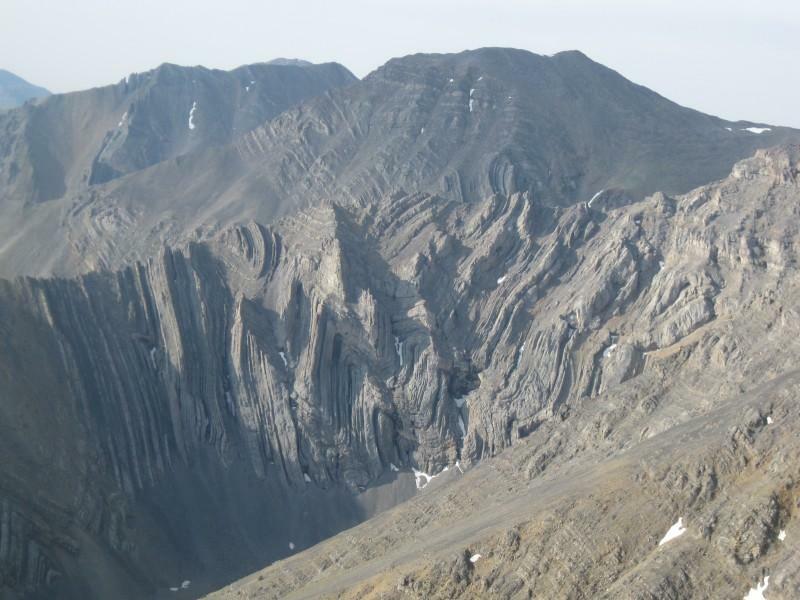 There is remarkable sedimentary folding on the slope of the mountain immediately west or southwest of the 9,400 foot nearly level area. Somebody should take a photograph of this. I consumed 4 hours 2 minutes for the ascent; 3 hours 35 minutes for the descent. The car-to-car time was 8 hours 11 minutes as 7:12 a.m. to 3:23 p.m.
A route ascending the east ridge is quite feasible, as there are no cliff bands to impede progress; and this would obviate going south first along the road grid prior to gaining elevation. Such a plan would meet the route currently taken at 11,000 feet just before the Class 3 portion. Last summer Chris Gilsdorf photographed the "remarkable sedimentary folding" I noted 5 1/2 years ago, and as displayed below. His entire report is available.